A powerful rebuttal of Hamilton, the logic of Brutus can be found in a supreme Court decision of 1819, McCulloch v. Maryland. Taken from "Brutus" fifth essay, The New-York Journal of December 13, 1787. This constitution considers the people of the several states as one body corporate, and is intended as an original compact; it will therefore dissolve all contracts which may be inconsistent with it. This not only results from its nature, but is expressly declared in the 6th article of it. The design of the constitution is expressed in the preamble, to be, "in order to form a more perfect union, to establish justice, insure domestic tranquility, provide for the common defense, promote the general welfare, and secure the blessings of liberty to ourselves and posterity. " 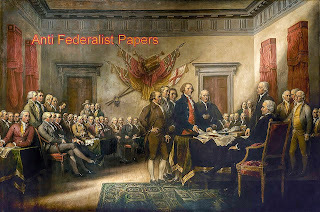 These are the ends this government is to accomplish, and for which it is invested with certain powers; among these is the power "to make all laws which are necessary and proper for carrying into execution the foregoing powers and all other powers vested by this constitution in the government of the United States, or in any department or officer thereof. " It is a rule in construing a law to consider the objects the legislature had in view in passing it, and to give it such an explanation as to promote their intention. The same rule will apply in explaining a constitution. The great objects then are declared in this preamble in general and indefinite terms to be to provide for the common welfare, and an express power being vested in the legislature to make all laws which shall be necessary and proper for carrying into execution all the powers vested in the general government. The inference is natural that the legislature will have an authority to make all laws which they shall judge necessary for the common safety, and to promote the general welfare. This amounts to a power to make laws at discretion. No terms can be found more indefinite than these, and it is obvious, that the legislature alone must judge what laws are proper and necessary for the purpose. It may be said, that this way of explaining the constitution, is torturing and making it speak what it never intended. This is far from my intention, and I shall not even insist upon this implied power, but join issue with those who say we are to collect the idea of the powers given from the express words of the clauses granting them; and it will not be difficult to show that the same authority is expressly given which is supposed to be implied in the foregoing paragraphs. 1st. What is included in this power to lay and collect taxes, duties, imposts and excises. 2nd. What is implied in the authority, to pass all laws which shall be necessary and proper for carrying this power into execution. 3rd. What limitation, if any, is set to the exercise of this power by the constitution. First. To detail the particulars comprehended in the general terms, taxes, duties, imposts and excises, would require a volume, instead of a single piece in a newspaper. Indeed it would be a task far beyond my ability, and to which no one can be competent, unless possessed of a mind capable of comprehending every possible source of revenue; for they extend to every possible way of raising money, whether by direct or indirect taxation. Under this clause may be imposed a poll tax, a land tax, a tax on houses and buildings, on windows and fireplaces, on cattle and on all kinds of personal property. It extends to duties on all kinds of goods to any amount, to tonnage and poundage on vessels, to duties on written instruments, newspapers, almanacks, and books. It comprehends an excise on all kinds of liquors, spirits, wines, cider, beer, etc. , and indeed takes in duty or excise on every necessary or conveniency of life, whether of foreign or home growth or manufactory. In short, we can have no conception of any way in which a government can raise money from the people, but what is included in one or other of these general terms. We may say then that this clause commits to the hands of the general legislature every conceivable source of revenue within the United States, Not only are these terms very comprehensive, and extend to a vast number of objects, but the power to lay and collect has great latitude; it will lead to the passing a vast number of laws, which may affect the personal rights of the citizens of the states, expose their property to fines and confiscation, and put their lives in jeopardy. It opens a door to the appointment of a swarm of revenue and excise collectors to prey upon the honest and industrious part of the community, [and] eat up their substance. . . .
Second. We will next inquire into what is implied in the authority to pass all laws which shall be necessary and proper to carry this power into execution. It is, perhaps, utterly impossible fully to define this power. The authority granted in the first clause can only be understood in its full extent, by descending to all the particular cases in which a revenue can be raised; the number and variety of these cases are so endless, and as it were infinite, that no man living has, as yet, been able to reckon them up. The greatest geniuses in the world have been for ages employed in the research, and when mankind had supposed that the subject was exhausted they have been astonished with the refined improvements that have been made in modern times ' and especially in the English nation on the subject. If then the objects of this power cannot be comprehended, how is it possible to understand the extent of that power which can pass all laws which shall be necessary and proper for carrying it into executions It is truly incomprehensible. A case cannot be conceived of, which is not included in this power. It is well known that the subject of revenue is the most difficult and extensive in the science of government. It requires the greatest talents of a statesman, and the most numerous and exact provisions of the legislature. The command of the revenues 'Of a state gives the command of every thing in it. He that has the purse will have the sword, and they that have both, have everything; so that the legislature having every source from which money can be drawn under their direction, with a right to make all laws necessary and proper for drawing forth all the resource of the country, would have, in fact, all power. Were I to enter into the detail, it would be easy to show how this power in its operation, would totally destroy all the powers of the individual states. But this is not necessary for those who will think for themselves, and it will be useless to such as take things upon trust; nothing will awaken them to reflection, until the iron hand of oppression compel them to it. I shall only remark, that this power, given to the federal legislature, directly annihilates all the powers of the state legislatures. There cannot be a greater solecism in politics than to talk of power in a government, without the command of any revenue. It is as absurd as to talk of an animal without blood, or the subsistence of one without food. Now the general government having in their control every possible source of revenue, and authority to pass any law they may deem necessary to draw them forth, or to facilitate their collection, no source of revenue is therefore left in the hands 'Of any state. Should any state attempt to raise money by law, the general government may repeal or arrest it in the execution, for all their laws will be the supreme law of the land. If then any one can be weak enough to believe that a government can exist without having the authority to raise money to pay a door-keeper to their assembly, he may believe that the state government can exist, should this new constitution take place. It is agreed by most of the advocates of this new system, that the government which is proper for the United States should be a confederated one; that the respective states ought to retain a portion of their sovereignty, and that they should preserve not only the forms of their legislatures, but also the power to conduct certain internal concerns. How far the powers to be retained by the states are to extend, is the question; we need not spend much time on this subject, as it respects this constitution, for a government without power to raise money is one only in name. It is clear that the legislatures of the respective states must be altogether dependent on the will of the general legislature, for the means of supporting their government. The legislatureof the United States will have a right to exhaust every source of revenue in every state, and to annul all laws of the states which may stand in the way of effecting it; unless therefore we can suppose the state governments can exist without money to support the officers who execute them, we must conclude they will exist no longer than the general legislatures choose they should. Indeed the idea of any government existing, in any respect, as an independent one, without any means of support in their own hands, is an absurdity. If therefore, this constitution has in view, what many of its framers and advocates say it has, to secure and guarantee to the separate states the exercise of certain powers of government, it certainly ought to have left in their hands some sources of revenue. It should have marked the line in which the general government should have raised money, and set bounds over which they should not pass, leaving to the separate states other means to raise supplies for the support of their governments, and to discharge their respective debts. To this it is objected, that the general government ought to have power competent to the purposes of the union; they are to provide for the common defense, to pay the debts of the United States, support foreign ministers, and the civil establishment of the union, and to do these they ought to have authority to raise money adequate to the purpose. On this I observe, that the state governments have also contracted debts; they require money to support their civil officers; . . . if they give to the general government a power to raise money in every way in which it can possibly be raised, with . . . a control over the state legislatures as to prohibit them, whenever the general legislature may think proper, from raising any money, (the states will fail]. It is again objected that it is very difficult, if not impossible, to draw the line of distinction between the powers of the general and state governments on this subject. The first, it is said, must have the power to raise the money necessary for the purposes of the union; if they are limited to certain objects the revenue may fall short of a sufficiency for the public exigencies; they must therefore have discretionary power. The line may be easily and accurately drawn between the powers of the two governments on this head. The distinction between external and internal taxes, is not a novel one in this country. It is a plain one, and easily understood. The first includes impost duties on all imported goods; this species of taxes it is proper should be laid by the general government; many reasons might be urged to show that no danger is to be apprehended from their exercise of it. They may be collected in few places, and from few hands with certainty and expedition. But few officers are necessary to be employed in collecting them, and there is no danger of oppression in laying them, because if they are laid higher than trade will bear, the merchants will cease importing, or smuggle their goods. We have therefore sufficient security, arising from the nature of the thing, against burdensome, and intolerable impositions from this kind of tax. The case is far otherwise with regard to direct taxes; these include poll taxes, land taxes, excises, duties on written instruments, on everything we eat, drink, or wear; they take hold of every species of property, and come home to every man's house and pocket. These are often so oppressive, as to grind the face of the poor, and render the lives of the common people a burden to them. The great and only security the people can have against oppression from this kind of taxes, must rest in their representatives. If they are sufficiently numerous to be well informed of the circumstances, . . . and have a proper regard for the people, they will be secure. The general legislature, as I have shown in a former paper, will not be thus qualified,' and therefore, on this account, ought not to exercise the power of direct taxation. If the power of laying imposts will not be sufficient, some other specific mode of raising a revenue should have been assigned the general government; many may be suggested in which their power may be accurately defined and limited, and it would be much better to give them authority to lay and collect a duty on exports, not to exceed a certain rate per cent, than to have surrendered every kind of resource that the country has, to the complete abolition of the state governments, and which will introduce such an infinite number of laws and ordinances, fines and penalties, courts, and judges, collectors, and excisemen, that when a man can number them, he may enumerate the stars of Heaven. Learn More About American History. Visit Jamestown, Williamsburg and Yorktown living history museums. Federalist Papers No. 26, The Idea of Restraining the Legislative Authority in Regard to the Common Defense Considered.